Thank you for ordering a copy of Degrees of Flight from the Lunation Press website. In the first instance, please email us at hedley.england@lineone.net with your location to determine the cost of postage. We will then inform you of the total cost. Please send a cheque which is the cover price of £14.99, plus first class postage and packing, made payable to Hedley England with your contact details to the address given in our email. When we have received the cheque and it has cleared, we will send you a copy of the book and E mail you to say the book is on its way. This process should take between five to ten working days from when we receive the cheque to when you receive the book. Alternatively, the book may be available at The Astrology Bookshop and the Midheaven Bookshop in London, and can also be ordered by your local book store through us, phoning 01233-639282. You can also phone us at any time on the same number to track the progress of your order. For overseas customers, payment is preferred by International Money Order in Pounds Sterling made out to Hedley England. Cancellations and refunds: In the unlikely event of you having to cancel your order, we can do so up to the moment we send the book to you, so prompt contact on your behalf is essential for a refund. After the book has been posted we cannot make any refunds. Non delivery situations will be looked at on an individual basis. 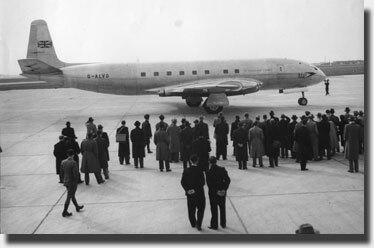 March 1951: The Comet prototype arrives at Kastrup Airport Copenhagen in Denmark having flown the 590 miles from London Airport in one hour forty two minutes. The regular air service takes three and a half hours. Click here to read the mystery of Malaysian Airlines 370, that ‘disappeared’ on March 8th 2014, written by Hedley England.